Hard-pressed Prime Minister Erna Solberg admitted on Wednesday that she was disappointed and thinks it’s “unfortunate” that her government’s two support parties have withdrawn from negotiations over the state budget. She’s not giving up efforts to keep her coalition together, though. Solberg told reporters at a press conference held just after the Christian Democrats announced their withdrawal of support that she had invited both party leader Knut Arild Hareide and Liberals leader Trine Skei Grande to yet another meeting at her home later on Wednesday afternoon. She took them at their word, that both parties still want to find a budget solution. Solberg began her briefing by running through what she clearly thinks are all the highlights of the state budget, from funding for schools to stronger health and welfare programs. She said the entire budget process, now widely believed to be triggering a government crisis, had turned into “something much different” than what she and her fellow Progress Party had wanted. “We believe we have gone far to meet the demands of the support parties,” Solberg said, adding that the budget still “was not good enough” to please them. “That’s unfortunate,” she said in her first public comments since the Liberals broke off budget talks on Tuesday. Solberg was determined to make another effort at finding a solution, however, even though she stated once again that the thorniest issue in the budget (the so-called bilpakken that calls for only minimal increases in fuel taxes and offsets others) was still not up for negotiation. It’s that “ultimatum” that the Liberals and the Christian Democrats have found most objectionable. Political commentators have also suggested the ultimatum may end up as a major political blunder for both Solberg and Jensen. Despite claims from the Liberals and Christian Democrats that they saw no possibility for further negotiations, they were expected to accept Solberg’s invitation to another meeting. Solberg would have to offer some other measure that would significantly cut carbon emissions, though, after promising to do so last year. It was unlikely Solberg would propose any halts in oil and gas exploration or production, but she may have something else up her sleeve. 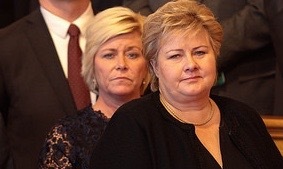 She said she was well aware that “all parties want to come out of budget negotiations with something that supports their views.” Solberg declined to speculate on what will happen if she and Jensen still fail to win Grande’s and Hareide’s support before the Parliament is due to debate the budget on Monday.